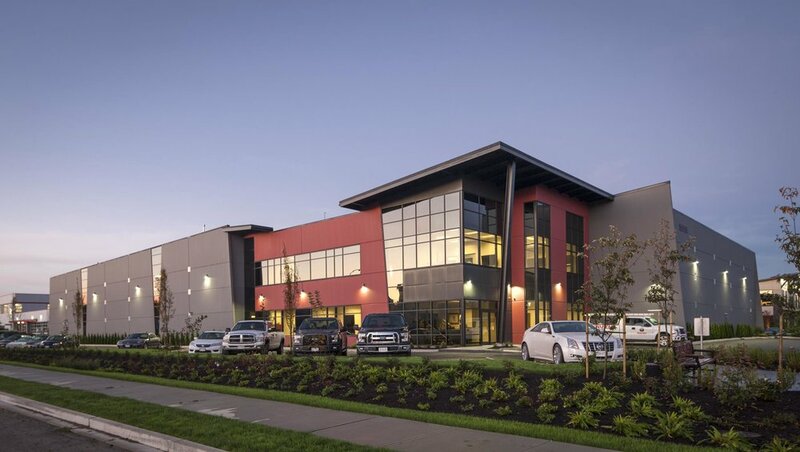 TECK CONSTRUCTION LLP has been building in the lower mainland of British Columbia since 1957. During the completion of approximately 600 commercial and industrial building projects, we have established a reputation for quality workmanship, performance and fairness that is admired and acknowledged by the industry. Testament to this is the fact that over 50% of our business is from repeat clients. Our projects have varied in size and complexity, from $100,000 renovations and additions to $10 million dollar commercial, industrial and institutional buildings. Approximately 95% of our projects are design-build, made possible by our experienced design and project management staff. Although we do some construction management projects, we generally employ a full crew to ensure fast and linear production and a quality finished product. We own a full line of standard and heavy construction equipment and do our own surveying, site work and civil work, concrete and carpentry. Our vertical integration eliminates an additional layer of markups found with most contractors who subcontract out more work. They must provide for the margins of the subcontractor as well as the markup of the general. We eliminate that subtrade markup and have better production and control on the jobsite. We are very proud of the reputation we enjoy in the lower mainland. For more on Teck Construction click on the following link to see our BC Business article. Cost effectiveness is built into our design-build projects. Our emphasis on value engineering in the design process ensures that you get a functional, attractive and cost effective building that meets your requirements. Most of our projects are "fast-tracked" to allow early occupation and to minimize the capital requirements and interim financing costs of the construction process. Often "turn-key" in nature, we always provide full service construction of the building. All permits and applications are scheduled and monitored by us to ensure speedy completion of the building. Also, our in-house design ensures continuity in the process from conception to completion. Teck Construction's design-build will provide a high-quality, economical building in a no-headaches manner for the client. As a general contractor we also provide first class technical support. Our office is fully equipped with meeting, tendering, design, accounting and project management facilities. We maintain current technology for design, administration and communications to ensure a smooth and efficient progression of the construction process. We are a traditional general contractor, not a management only company. We always employ a full crew to ensure fast and linear production and a quality finished product. We own a full line of standard and heavy construction equipment. This includes three high-lift, all-terrain forklifts for material handling, two Caterpillar backhoes and a bulldozer for earthwork, four excavators ranging in size from 12 tonne to 29 tonne, two rollers and a fleet of trucks. Having this equipment at our disposal helps us provide first-class service to clients in an economical way. Teck Construction has been constructing Design-Build projects since 1960. Forming over 90% of our annual volume, design-build is a process in which we are responsible for the design phase as well as construction. This has proven to be far more cost effective and time effective than hiring an architect and tendering the project. Teck Construction is responsible for providing an effective and complete building for your use, eliminating the usual change-order problems from inefficient designs and contractual ambiguities. Pricing is "open-book" to the client, allowing the customer full knowledge of prices and profits to maintain a fair and equiptable relationship. Cost effectiveness is built into our design-build projects. Our emphasis on value engineering during the design process ensures that you get a functional, attractive and cost effective building that meets your requirements. Most of our projects are "fast-tracked" to allow early occupation and to minimize the capital requirements and interim financing costs of the construction process. Often "turn-key" in nature, we always provide full service construction of the building. All permits and applications are scheduled and monitored by us to ensure speedy completion of the building. Also, our in-house design ensures continuity in the process from concept to completion. Teck Construction's design-build will provide a high-quality economical building in a no-headaches manner for the client. This vertical integration of the construction process allows us greater control over production schedule and costs. Our crews are very efficient. We are confident that any construction requirement taken on can be handled efficiently and economically. Al Tecklenborg formed Teck Construction in 1957 and developed the firm's remarkable reputation it has today. This reputation and success of our company is built through years of reliable service to our clients and standing behind our work. The wealth of experience Al has gained over the years in the construction business provides the basis for the “Teck System” that is now the fundamental basis of Teck Construction. Although now retired, he still drops in once in a while as his sons Albert & George assume the leading roles.